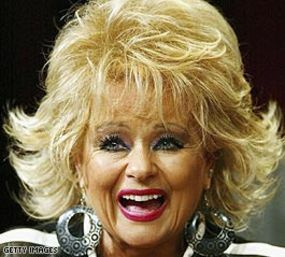 paskewich.com: Post # 100 "I Love Tammy Faye Bakker!" Visit my blog? With the verses you read still brewing in my mind, I wrote today's post. I can't believe God loves to use us broken, broken, almost shattered people to do marvelous things. And that Satan is afraid enough of us to come after us. What a crazy plan. Joe, I remember watching the PTL club together with you at Mom's. I always got a kick out of Tammy. She had a preciousness to her amidst her glam that you just couldn't help liking. Her joy was incredibly evident in her last interview with Larry King. It was so hard to watch this woman known for her exuberance and flamboyance being so weak -- and yet her joy and faith in the Lord was crystal clear and contagious. It was such a meaningful interview. She made me laugh when asked "What do you want to be remembered for?" and she answered, "Oh, my eyelashes" and laughed. And then said "No ... my walk with the Lord. I want everyone to know that there is great peace & joy in knowing Jesus Christ as your Lord & Savior." Awesome. There was also a clip that made me weep ... Tammy said "I'm very grateful to the Lord for taking a little girl who had nothing to give ... but was willing to try." "I trust Him with me," she said several times. What a sweet grace and simple faith she had. She loved Him. She trusted Him. Simple as that. She was truly an inspiration. It's funny how often we define for ourselves what is acceptable to say and do;not necessarily based on scripture but on acceptance of the Christian community. We can get so uptight about (in over)our communication, and our testimony- to the point of it really being more about "our pride " masked as us giving God glory. It becomes a fake script or role played out. The world has already seen that play a thousand plus times. Tammy dared to take it to the level of "reality" :), She didn't care if she looked like a fool at times as long as it was for Jesus. A fool for Jesus is no fool at all! I know pretty sad Proverb!! Right up there with -"On a bad day ,don't be mean." I don't know.. I think that "A fool for Jesus is no fool at all is a great proverb!" WoW! It was only recently that I started loving Tammy Faye and really appreciating her. Before that she annoyed me, but how many people have I annoyed in MY life?! I'm sure the numbers are great. I came to see Tammy Faye more of a kindred spirit - someone who just kept following Jesus, no matter what; someone who was persecuted by those who thought they were holier and judged when they didn't truly know her heart. How can any of us judge when we don't truly know other peoples' hearts? I see judgment as a leading sin in Christians' lives. I've seen people destroyed by the judgment of others. Jesus tells us to love one another - not to judge. Tammy Faye was a great example of that. Sunday's outdoor service was beautiful. Good idea... glad it worked out. Visit my blog? My post entitled, "Blog Post for Dummies," is, in part, a tribute to 1st John. How has you summer/fall vacation going? Anyway, I got that book, I Was Wrong, from Amazon today and read the first 3 chapters. I actually couldn't get through the acknowledgments page without crying. Nothing like a heart full of repentence and gratitude, on its way to being healed (as healed as it can get this side of Heaven.) Thanks for the recommendation. I know I'll enjoy reading the rest. And won't it be cool, in Heaven, to worship with Jim and Tammy Faye and Billy Graham and Ruth and all the people who hurt us in the past (and those we hurt)... with no pain, no conflict, nothing but perfect unity and love and purity. This is a good post. I would ask you to consider putting something new up in its' place, though. We've been hanging out with Tammy Faye for about 3 months now. Like so many Christians, I too laughed at Tammy Faye. Actually before I was a Christian, I used to smoke pot and turn on her show just to laugh at her as her mascara ran down her face. One day while watching, I prayed and repented of my sin and asked Jesus to love me and be my Lord. 31 years on and He has always honoured that prayer. How i thank God for directing my steps to hear the Good news of Jesus through Tammy. I have never looked back. I am always encouraged that the Lord can use anyone who makes herself available. Thank you Pastor Joe for the beautiful tribute to T.F. watch zeitgiest the movie . then you dont talk like fools!!!!!!!!!!. This is just amazing! Thanks for reporting it. By the way, in what sense is Tom Rob Smith a gay author?